I have a love affair with chocolate, but there is one dessert that I think takes the blue ribbon. Period. No questions. No discussion. Just asked anybody who I have ever made them for. They are coveted. And I will hunt you down and kill you if you try to pass this off as your own. Got it? This is MOSTLY the recipe I use in my home, but I am leaving out a couple of ingredients, but these still are delicious. If you want to try the real thing, you'll have to be invited over for dinner. One more thing, I know it's not strictly paleo, but the mascarpone is from grass fed cows. So there. 1 vanilla bean, cut in half and seeds scrapped out. In a 9 x 13 pan, lay peaches cut side down. In a small bowl, whisk together water, honey and vanilla seeds. Cut the two bean halves into 1 inch pieces and then put in marinade. Pour over the peaches and allow to marinate for about four hours, turning the peaches about every hour. Preheat grill to medium heat. While grill is heating, mix mascarpone, honey and vanilla seeds with hand mixer until well blended. When the grill is ready, remove peaches from marinade and place cut side down on grill. Grill about 3-5 minutes or until they have caramelized grill marks. While they are grilling, brush peaches with marinade. 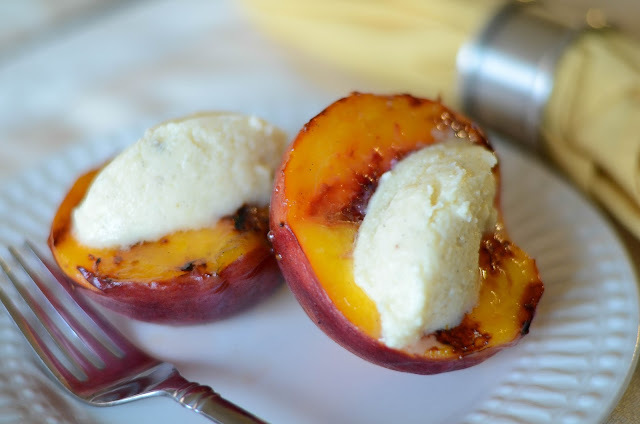 Turn peaches and brush cut sides with marinade, and grill about 2 minutes. Turn the peaches one more time and grill about 2 more minutes. Remove and set on a serving plate. Scoop about 1 tbsp. of the mascarpone filling in each peach center. Allow to set for a couple of minutes so the cheese starts to soften.